It is amazing the number of varied drinks that coffee beans can produce. These variations come as a result of brewing techniques, mixing and blending techniques. Of all the coffee variations, two have come out as the most popular; Coffee Latte is famously known as latte and espresso. Let’s look at each to discover what the real difference is between the two. So what is actually Espresso? The name espresso is originally from Italy. It loosely translates to a cup of coffee made expressly for you. Espresso has been around for a long while now. The first espresso dates back to 1901. The modern espresso machines are so advanced that you can make a cup by just a touch of a button. There have been a lot of myths and misinformation about what espresso really is. And this has left many people including coffee enthusiasts confused. Like some believe that espresso must be dark roast hence bitter. But the truth is it can be dark, light or moderate depending on most regions and one’s preference. There have been so many explanations of what espresso is. This type of coffee is specifically made by an espresso maker that has been programmed to maintain a certain temperature, pressure and brewing time. If you do not have an espresso-making machine, however, you can use a pot on the stove although this will make a rather substandard blend of espresso. The espresso coffee is very concentrated and has a thicker consistency compared to other blends of coffee. This is why most people assume that espresso is very bitter. Come to think of it, it is for this reason that it is served in a very small quantity. They also come out very flavorful and stronger. Because of the high coffee concentration, espresso is used as the base for other variations of coffee. When properly brewed, the espresso will have a layer of rich dark golden cream that is known as the crema on the surface and which is an indication of a quality espresso. While most people prefer their espresso sugarless to get the actual taste of the espresso, it is still okay to add sugar or even flavor it. Espresso is made by an espresso machine that is labeled “espresso machine”. A true espresso machine produces a pressure of at least 9 BAR to force water down the finely ground coffee. They are either lever operated or pump-driven. Latte on the hand is a variation of espresso where steamed milk is added to make it creamy and a layer of foam to make it velvety, flavorful and add to the presentation. In fact, the name coffee latte means coffee with milk. A latte is sometimes known as a ‘wet Cappuccino’ because it has more steamed milk and less foamed milk than a cappuccino. To make a latte, you will add 6 to 8 ounces of steamed milk to one shot of espresso. You can also top it up with a thin layer of foam. For a large latte, make the espresso a double shot. Lattes are famously known not only for their impeccable flavor but also for their art. In most coffee shops, you will be served a latte with a flower pattern, a face or even a bird. It’s amazing how it’s done. The patterns are made with steamed frothing milk. 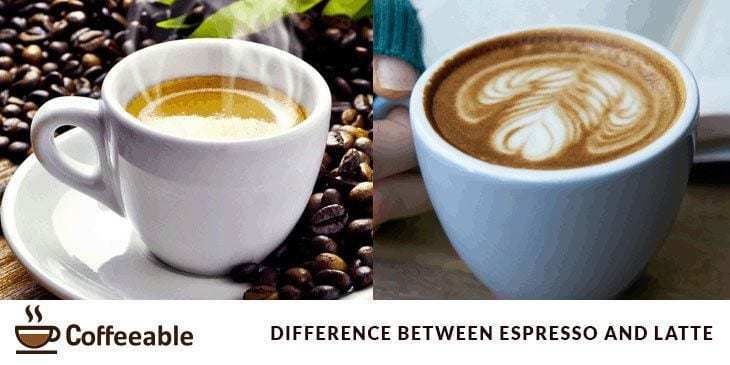 There is a clear distinction between espresso and lattes. Espresso is very concentrated, has a dense flavor and is the strongest of the two. Espresso is used as a base for making lattes, there is no latte without an espresso. Basically, lattes are espressos with added steamed milk while espresso is just plain coffee concentrate.